I hate to throw things away… I’ll admit that in our house we even have a room that we jokingly call the ‘hoarders room’ in which I stash that which I cannot find another home for when I’m cleaning up the rest of the house… Matt dreams of it becoming an office someday, but for now, it’s got a mish-mash of craft projects, piles of mail, photographs and bills and a hodge-podge of toys, books, and things that the kids have outgrown. When Ethan was born, I began scrapbooking, and I now have four years of scraps built up – such pretty papers, and I think, oh, I might need that little piece for an accent or border or something, so I save it. And then when some new craft idea strikes my fancy, I’m sure that my husband inwardly groans at what mess will follow. Well, let me tell you that I have found the perfect craft project! Since I had left over magnets from the Clothespin Caterpillar Magnets that I made with Ethan, I was trying to think of a little project I could do with them. Browsing Hobby Lobby (my creative heaven! 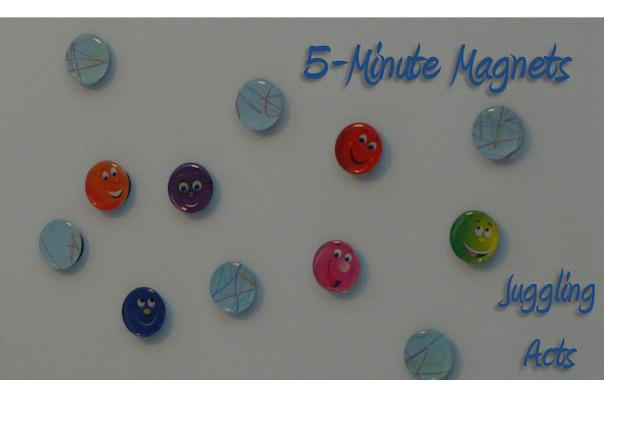 ), I came across some little clear acrylic sticky circles and suddenly this next project dawned on me – 5-Minute Magnets! And the best part? I got rid of some stuff! Ok, so not much, but still, it was something and I got my little creative fix for the day! Select two or three coordinating papers and use the punch to make the circles. Stick the clear circles to the paper (be sure the pretty side is showing on the smooth side). Then just stick the magnet onto the back of the acrylic circle. Volia! 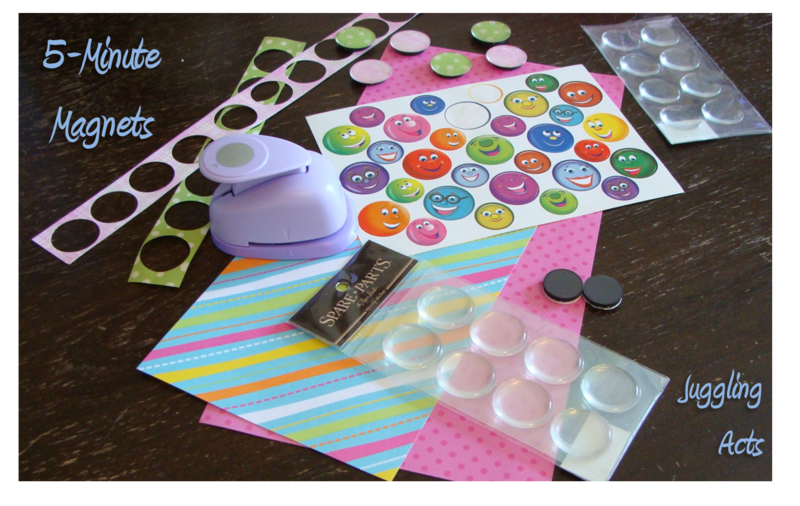 Now, if you can’t find the self-adhesive magnets, you could use glue, but then they take time to set up, of course. I got such satisfaction out of this quick little project that took almost no time and left little mess (I did toss the scraps of paper from this project since there wasn’t much left over… though I wonder what I could do with a long strip of paper with circles punched out of it… hmmm…. Anyhow, Ethan helped me punch out the papers, but once that was done, got bored and wandered off. (Admittedly, this project is more suited for older children.) I dug through a box of his stickers and came up with some cute smiley faces and made a set of magnets that he could give to a friend. And then just I couldn’t stop! I grabbed a colored pencil drawing that Ethan brought home from school. Now sometimes I cut these down and use these to make cards for friends and family, but this one was done on scrap paper and the back had text on it… so I punched away and came up with some cute little keepsake magnets of his artwork. I just love these! 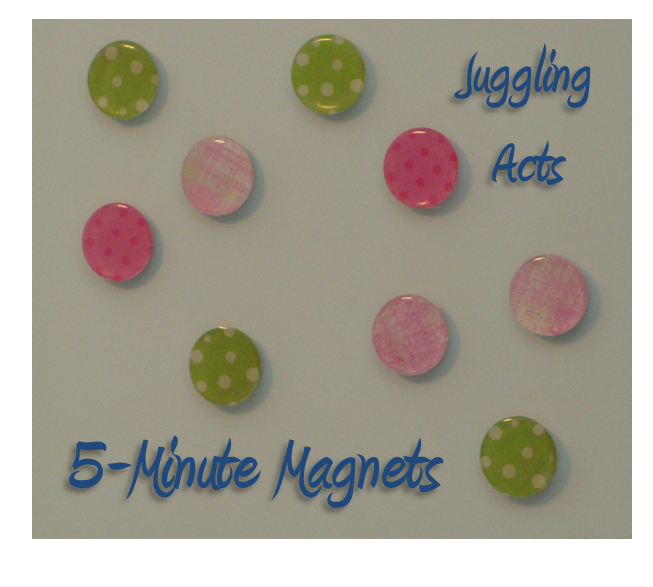 The magnets are so simple, yet pretty, and would be a cute little party favor or stocking stuffer, too. Hope you will enjoy this quick project as much as I did. Please note that these magnets could be choking hazards for small children and should be kept high up on the fridge for those with infants/toddlers in the house.